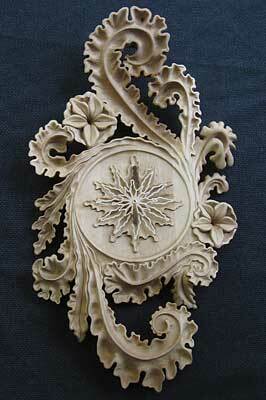 Where does woodcarving fit in with contemporary design? Perhaps Lizzy Ashworth has the answer. An exciting young carver, designer and craftswoman, Lizzy's work embraces the ornamentation of the past and unites it with the present day, combining decorative, Rococo-influenced artistry with modern design and technologies to create pieces of beauty balanced with utility. I caught up with her to find out more. Born in Preston, Lancashire, Lizzy grew up in Yorkshire, and traces her interest in woodwork back to a film that captured her imagination as a child. "I remember watching a film called Treasures of the Snow, which involved an old man who had a workshop in the Swiss Alps. A young boy caused an accident and was cast out of the village. The old man took him under his wing and taught the boy to carve, and using his new skill, the boy tried to earn forgiveness. The carving wasn't the main point of the film, but it stuck with me and sparked my interest in woodwork." From that point on, Lizzy was captivated. Whittling sticks and twigs from the garden with a blunt kitchen knife may not have produced the best results, but her parents and teachers noted her interest and encouraged her to develop it. "In high school I really got a taste for furniture making and made my first piece - a piano stool." And, recognising her passion for woodwork, Lizzy's DT teacher, Dave Thornton, also introduced her to woodturning, allowing her to work through break times on the lathe. But it wasn't until her second year of university that Lizzy applied her woodworking talents to embark on a journey into carving. 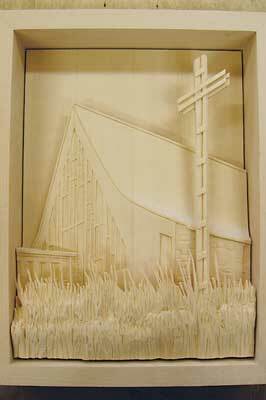 In the first year of her BA (Hons) Degree in Furniture Design and Craft at Bucks New University, Lizzy was offered the opportunity to take part in a three-month Erasmus exchange programme the following year to train in decorative woodcarving in the small town of Jurva in Finland. "I jumped at the chance and signed up," she says. "When I got home, I had to check the map to see where Finland was!" 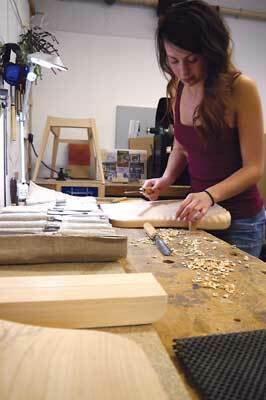 In Jurva, Lizzy discovered a love for carving, and even extended her exchange for the full academic year. Far from dipping her toes in the shallow end of the carving skillset, her training began in the notoriously challenging Rococo style: "It's one of the most difficult styles to carve in and gives a good grounding, so that's what I began with," she explains. 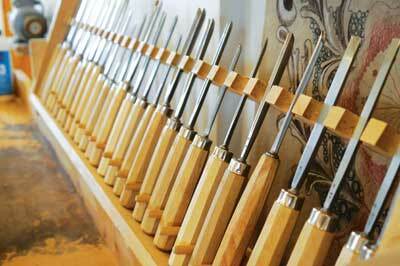 In fact, Jurva's College of Crafts and Design is one of the few worldwide to teach a particular technique that doesn't use a mallet, which means that the chisel's blade can be sharpened to a shallow angle of about 17º. This shallow angle allows the carver to take a bigger cut and finish with a smooth surface - when you master the technique, you can finish a piece without the use of abrasives. "I'm keen to perfect this method of working and I really enjoy it, as you are so in touch with the curves you're carving - the control over the tool feels like it's an extension of your arm. 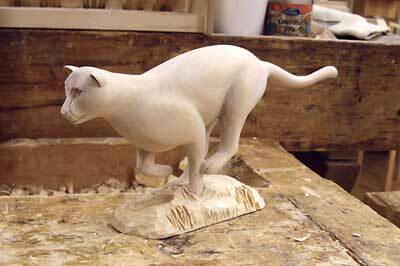 I've tried to use a mallet but it just doesn't feel natural or comfortable for me after carving like this." Lizzy's go-to tools are a set of around 30 Dastra chisels, the 10mm No.3 being one she often reaches for, and she carves mostly in Finnish birch (Betula pendular) and that most loved timber for carving, lime (Tilia vulgaris). "Lime is the most pleasant to work with as it's so consistent, but birch offers a stronger alternative when doing structural or very fine detail work." 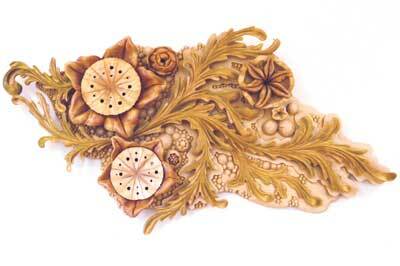 The Rococo influence is apparent, but Lizzy's work certainly isn't limited to its boundaries. "My style naturally developed through adapting the Rococo style and trying new shapes and derivatives," she says. "During my time at the school it was great to be able to carve without an agenda, so I was able to try sculpture and relief carving too. I am keen to explore new avenues and not stay within the confines of a set style." Not only was the tuition at Jurva's College of Crafts and Design invaluable, its location in the Finnish forest also provided the ideal environment for a carver who cites nature as her greatest inspiration. "I find that it feeds my imagination and creativity. Even if I'm not carving flowers or leaves directly, I still like to be surrounded by nature. In Jurva I could always get the peace I needed to recharge." So taken was Lizzy by the school and its surroundings, she arranged a return to Jurva in 2011, being awarded a bursary from the Worshipful Company of Clockmakers to spend a further four months at the school. "I felt I needed more time to develop and practise the craft," she explains, and with the coupling of beauty and function running through her work, what better route to take than clock case making? "They are something made for looking at, so they should be beautiful - a perfect canvas for me to express my artistry!" And it's a canvas she makes superb use of; the piece that introduced me to Lizzy's work was her 'Layers of Time' clock, which stood out among an array of ingenious pieces of furniture and homewares by talented young designer-makers at the New Designers graduate show. 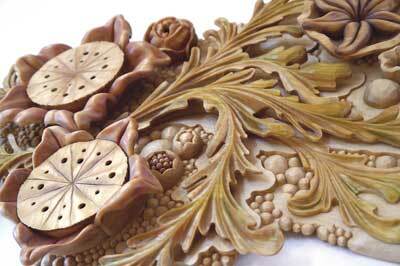 At first glance, it is a beautiful piece of decorative carving - a gracefully flowing, layered arrangement of flowers, leaves and berries. 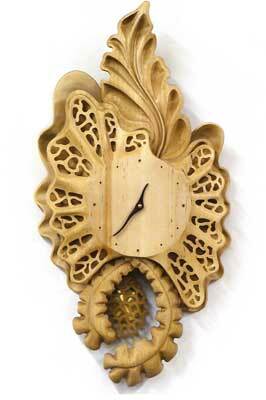 But there's more - within the two largest flowers are hidden a discreet clock face and second hand. "The only clue is the quiet ticking that can be heard from beneath. I hope that those who know its secret can feel an attachment and connection with the piece," she says, with that inimitable design vernacular, less encountered in the carving world. Her clock cases vary greatly; 'Ocean Leaves' is a swirling oceanic arrangement of seaweed forms executed with an apt sense of fluid movement; its style closely resembling her Rococo origins. Further removed is 'Passementerie', a cleverly layered piece combining foliage and cellular imagery, wonderfully utilising the natural figure of the wood and its depth, a trait that can be seen in much of her work. "I think it's important not to be afraid to make levels and carve the depth of the wood: be brave!" It's not only clocks that Lizzy turns her carving flair to, and, alongside traditional hand carving, she's not afraid to make modern technology her friend. Take her 'Connect' screen, for example; the screen's elegant background is CNC-cut and can be transformed into numerous configurations, making it adaptable for a huge variety of settings. 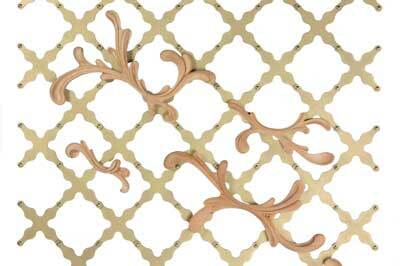 It is adorned with carved elements - as many or few as the customer likes, making it further customisable. The screen somewhat resembles a garden trellis with climbing plants, and could be equally suited to the home or commercial environment, bringing a light, natural atmosphere to either setting. "I want to utilise the best of both traditional handcraft and modern technologies - the repetition of computational design mixed with the soul and warmth of woodcarving," she says. In the steep rise of the digital age, it's encouraging to see such a talented and dedicated carver integrating decorative carving with modern design and technologies. Lizzy's work is a reminder that traditional craft and digital technologies are not mutually exclusive; rather than competing with the perpetual advances in technology, craftspeople can embrace, adapt and combine methods to make something new. 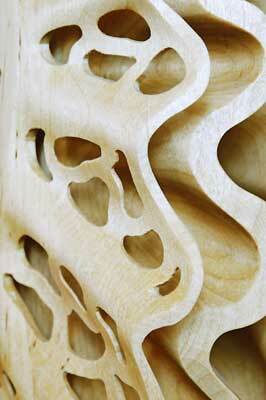 As well as contemporary woodcarvers such as Kaj Lindgard and Hannu Kumpula, Lizzy takes inspiration from such digital designers as Michael Hansmeyer and Marc Fornes, both of whom work in computational architecture to create designs that would be unachievable without digital technology. "I am often overwhelmed and threatened by what can be created digitally" - a fear that many carvers may well share - "but I remain confident that these technologies will never replace hand carving, as it offers a special quality and aesthetic that just can't be replicated digitally. Using both of these skills together to create the unimaginable is an exciting thought." With a forward-thinking attitude, innate design savvy, refined carving skills and pure dedication to creativity, you can bet that Lizzy Ashworth is a craftswoman with a very bright future.